The Pacific Division was perhaps the toughest division in the NHL last year, and is shaping up to be just as good this season. Last season, four of the five teams made it into the playoffs, the only division to do so. The San Jose Sharks won the division with 105 points, while the Anaheim Ducks, Phoenix Coyotes, and Los Angeles Kings rounded out the quartet of teams to make the post season with 99, 99, and 98 points respectively. The Dallas Stars missed out on making it a fullhouse by notching 95 points, two points below the 97 that got the eighth place Chicago Blackhawks into the post season. This was the only divsion where not one team finished the season with a record below .500, with each team finishing the season with at least 12 more wins then loses. Only the Stars finished the season with a negative goal differential. Things have only gotten tougher in the Pacific, with each team making benefitial changes to their rosters and organizations over the summer break. Last year's division winner, the San Jose Sharks, found themselves losing a Western Conference Finals series for the second straight season. So Sharks GM Doug Wilson made some moves that may give them that extra push needed to reach the playoffs. After shipping Danny Heatley and Devin Setoguchi to the Minnesota Wild, the Sharks brought in size in Brent Burns, Jim Vanermeer, and Michal Handzus, and to balance out that size they acquired speed in Martin Havlat. Things are definately looking up in the Bay Area. As we move down the West Coast, we stop off in Los Angeles were the Los Angeles Kings proved to be one of the big winners in the off season. They did lose Handzus, Wayne Simmonds, Alexei Ponikarovaski and prized prospect Brayden Schenn, but picked up Mike Richards and Simon Gagne. That is alot of fat trimmed and grit and speed added. Overall the Kings are set for another competitive year, they have one of the best goalie tandems in the league, Anze Kopitar will be returning from an injury that sidelined him late last season, and they added a surplus of leadership for a young team over the break. 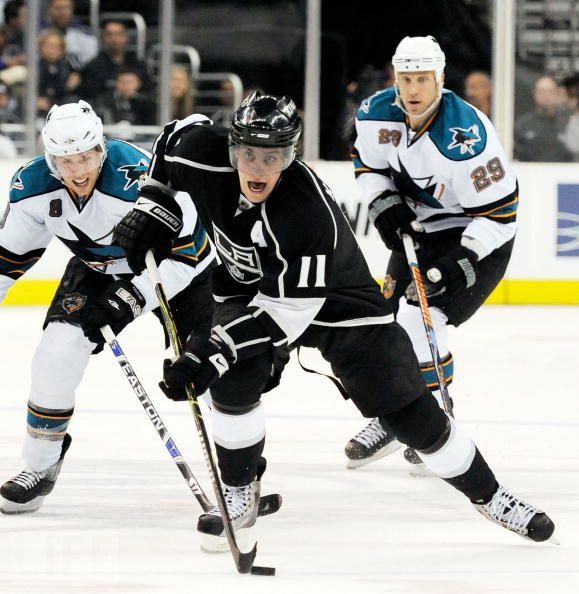 The Kings have definatley pushed their name into contention for favorite to win the Pacific. Now, all the Kings are waiting on is for young star, Drew Doughty, to re-sign and then things will be golden in Los Angeles. As we travel just 30 minutes down the CA-5 South, the Anaheim Ducks had perhaps the quietest off season in the division, which has primarily been spent waiting for Teemu Selanne's decision on whether or not he will retire, or return for another season. Other than that the Ducks only noteable off season acquisition was Andrew Cogliano who will add depth down the Ducks' center and make a push for that second line center spot. Other than that, next season will be another season where Ryan Getzlaf, Bobby Ryan, and Corey Perry carry the team. Also with goalie Jonas Hiller's return the Ducks will once gain be solid in net. The Ducks should be just as good, if not better next seasson. The Phoenix Coyotes gained a lot of grit over the off season with the additions of Boyd Gordon and Raffi Torres, which should make the Coyotes' third line, a hard checking line. However, the 'Yotes may have lost more than they gained with premier goaltender, Ilya Bryzgalov, packing his bags for Philadelphia and bringing a shakey Mike Smith to replace him. The Coyotes did lock up Keith Yandle for another five years, he will likely serve as the team's go to defense man. However, things might get a little shaky out in the desert this season. Continuing with the desert theme, the Dallas Stars completed a pretty heavy overhaul of last years roster despite missing the post season by only one game. They hired a new coach, Glen Gulutzan, and signed seven new players. They did see their number one player, Brad Richards, leave for the New York Rangers, but did sign Michael Ryder, who proved to be a key piece to the Stanley Cup Champion, Boston Bruins. The Stars did roll the dice on newly signed Sheldon Souray, if he catches a second wind could prove vital for the Stars defense and power play. The Stars may struggle to find the offense they lost with Richards' departure, but should still do well through out the season due to their depth through the rest of their roster. What else is there left to say, the Pacific Division has to be the hardest division in the NHL. All five times were in the hunt for a bid into the playoffs last season. Each time has a top line that can keep up with the league's best, and enough depth behind that top line to fall back on in case of injuries. There is not one favorite to win the division, more likely three teams that have the right parts to take a run at winning the division. Unlike other divisions all five teams are solid contenders and with the strong youth movement in each locker room, should be for the next few years. Watch for all five teams to make it into the playoffs next season.